Manufacturer of a wide range of products which include cardiovascular chest sheet drape and cabg pack. The surgical drapes for cardiovascular surgery provide efficient infection control featuring effective fluid control for a dry working area. offers a wide range of specifically designed single drapes and sets for all type of interventions within cardiovascular surgery. All-in-one design and integrated incision films and pouches allow for easy and efficient handling. Being a client-centric firm, we are offering a quality tested array of Cardiovascular Drape Set. The Cardiovascular Drape Set we offer is suitable to meet the applications of the hospital industry. Offered Cardiovascular Drape Set is available in various specifications and known for their durability. 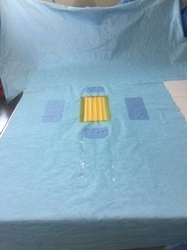 Cardiovascular set : The set contains all items needed for draping patient including a large slit sheet, a chest drape as well as foot covers. Pack 1- Large Sheet Size: 275 Cm X 160cm - 1no. - Square Sheet Size : 80cm X 80cm - 1 No.- Big Towel Size (perineal Towel) : 80cm X 80cm - 1 No.- Bottom Drape Sheet (bottom) - Size: 120x160cm - 1 No.- Draw Sheet With Adhesive - Size: 20ccm X 100cm - 2 Nos.- Wing Sheet- Size: 235x160cm - 1no.- Main Drape With 3m Ioban - Size: 250cm X 175cm - 1no.- Shoe Cover (triangular) - 1 No. Pack 2- Trolley Sheet - Size: 200cm X 160cm - 1no.- Saddle Bag - Size: 150x30cm - 1 No.- Disposable Bag - Size: 70x30cm - 1no.- Tubing Organizer Big - 1no.- Small Towel Size: - 2 Nos. 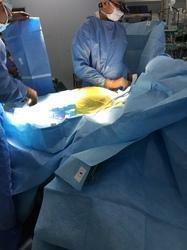 Pack 3- Wraparound Reinforced Surgical Gown With 2 Hand Towels - 3 Nos.- Wraparound Surgical Gown With 2 Hand Towels - 1no.